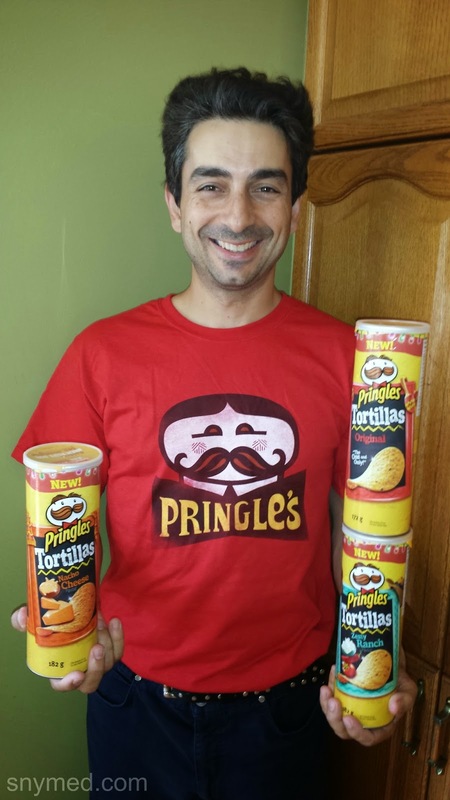 Smiles All Around for Pringles Tortillas! A box of the latest Kellogg Canada goodies showed up on my front porch, much to the delight of my family! The kids pretty much went bonkers over the new family size of Kellogg's Krave chocolate cereal, and my youngest child was drawn to the new Rice Krispies Multi-Grain Shapes cereal. I immediately noticed an old favourite: Special K Original, but with a new recipe. Also, I spied Special K Low Fat Granola, now with Vitamin D.
What surprised me in the box, was Pringles Tortillas, as I did not know that Kellogg is linked to this crunchy favourite. My husband was ecstatic for the Pringles Nacho Cheese, Original and Zesty Ranch flavours. And as you can see from the photo above, he was also delighted to receive a fun Pringles t-shirt. As a family of seven, it did not take long until all the cereal boxes and tins were opened and sampled! Frankly, all the products were very popular, with the Kellogg's Krave cereal vanishing quite rapidly--much to the lament of my 5-year old. Being a health-oriented parent, I will continue to buy the Special K Original and Special K Low Fat Granola cereals regularly, but save the others as a "sometimes" or "treat" cereal. And I'll stick with buying Pringles Tortillas in Original flavour for dipping into salsa. But wow, did my kids ever fight over the Nacho Cheese and Zesty Ranch flavours! 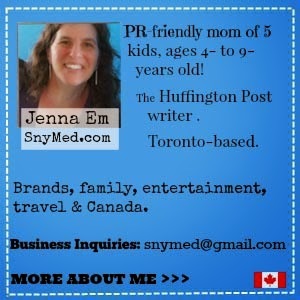 WIN a Kellogg Canada breakfast and snack prize pack from the SnyMed.com blog! 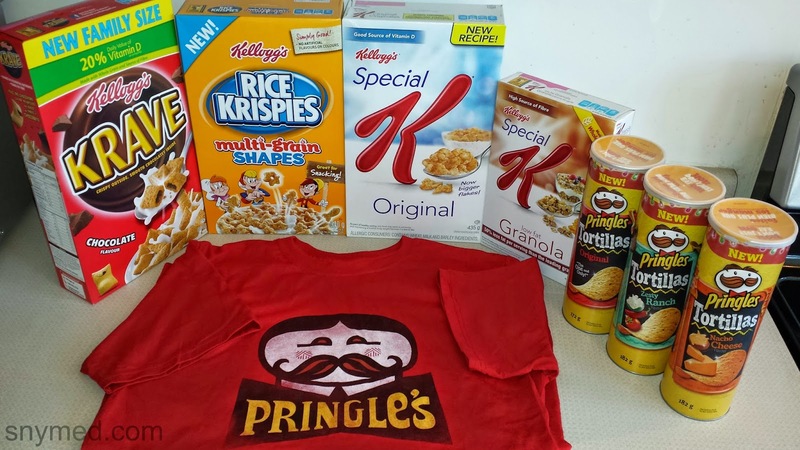 Prize pack may or may not be the same as the one pictured above (1 Pringles adult-sized t-shirt, 1 Kellogg's Krave cereal, 1 Kellogg's Rice Krispies Multi-Grain Shapes cereal, 1 Special K Original cereal, 1 Special K Low Fat Granola cereal, 1 Pringles Tortillas Nacho Cheese, 1 Pringles Tortillas Original, and 1 Pringles Tortillas Zesty Ranch snacks.) Contest open to Canada, and ends on Thursday September 18th, 2014. Leave a COMMENT below, stating what Kellogg Canada or Pringles product you'd like to try the most (or have already tried). Then, use the entry form below to enter. GOOD LUCK! would love to try anything new you have coming out love all your stuff yummy. I like the gluten free rice krispies. I wold love to try the new tortilla pringles. We love the pizza flavoured pringles here. I'd like ot try the cheese tortilla pringles. I would like to try the Krave cereal, it looks yummy. I have been wanting to try Krave but haven't bought it yet. the pringles nacho cheese! OMG YUM! I usually buy Pringles BBQ chips but I'd like to try the Pringles Tortillas Nacho Cheese. I really want to try the Pringles Tortillas! Ive had the zesty ranch, so good! I would most love try the Pringles Tortillas Nacho Cheese. The Pringles Nacho Cheese look awesome! Pringles Tortillas Nacho Cheese I can't wait to try! I'd love to try the Pringles Nacho Cheese! I would like to try the Nacho Cheese Pringles. I'd like to try the Rice Krispies Shapes, think the grandkids would like those. I'd like to try the Pringles Tortilla Original. I've seen that it's great with invisible dip. I'd like to try the Rice Krispies Multi-Grain Shapes cereal. Special K Low Fat Granola cereal would be nice to try and my son would love the Pringles Tortilla Chips! I would love to try the Nacho Chese Tortilla Chips. Sounds yummy!! All of the Pringles Tortillas sound good! I'd love to try the Pringles Tortillas! I'd love to try anything new love your products! the new Pringles Nacho Cheese Chips. I would love to try Pringles tortilla chips! Zesty ranch!!!! Spicy all the way!!!!! Les pringles tortilla chips, je ne les ais pas encore vue des nos épiceries. I'd like to try the Pringles Tortillas Nacho Cheese. I like the dill pickle pringles! i'd love the try the Pringles tortillas the most! I'd like to try the Special K Granola or anything Special K. Thanks! I'm looking forward to trying the Krave cereal. Would Love to try the Pringles!! I would love to try the Pringles Tortillas Ranch snacks. any pringles are delicious, especially in a tent.. I've always loved Rice Krispies so I'm looking forward to trying the Multi-Grain Shapes.